English 313 “Studies In Popular Culture” Fall 2017. (NORTHRIDGE, Calif., Aug 7, 2017) — Condensing the monumental impact that popular culture has on consumerism into a single-semester syllabus is nothing short of a superhero feat. 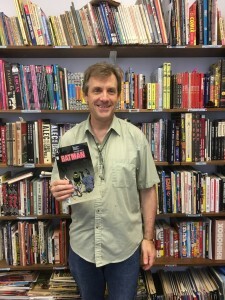 English professor Charles Hatfield holds up a Batman novel inside his office in CSUN’s Sierra Tower. Photo by Lucas Wiggins. The class — designed to explore the way audiences interact with and use mass culture and the possible social and political meanings — gives students the opportunity to critically analyze transmedia marketing by studying popular art forms such as comics and movies. “The idea is not just comics, it’s Batman in all media: music, TV, games, toys, etc.,” Hatfield said. “In the study of mass culture, there’s the argument of structure versus agency. If you’re on the agency side, then you would be inclined to say that the consumers of mass culture are not just passively absorbing whatever the culture industries provide. However, the structure side denies that we have agency, that as individuals or as communities, we don’t have the power to resist whatever is being given to us. Spanning generations, the long life of Batman has led to drastically contrasting interpretations. These clashing versions of the character take on different attitudes, providing topics for discussion on issues such as justice, economic and social class, crime and gender. The course objectives stress the influence that media marketing has on these issues, as well as how consumers and fans are affected, according to Hatfield. Students enrolled in the course this fall can expect to leave the class with an understanding of the marketing strategies used by corporate media giants like DC Comics, and how consumer choices are influenced by them. “Students will draw a lot of knowledge about the history of the Batman franchise, but that’s not the primary thing,” Hatfield said. “They’ll come away with a sense of what people call a transmedia franchise, or a cross-platform franchise, how that’s variously expressed and the fact that a franchise can move across media.